From Romance and a Quest: Now and again glimpses had been caught as the car topped on one of the countless ridges which traversed the country but the realisation of the magnitude of her task came to Morag until Anderson stopping brought his arm round in a circular sweep. “There’s Taba Bomvu Miss MacDonald – now somewhere on it or round it or about it, there’s an ancient fissure in the earth which has been filled with quartz. Thirty-five years ago old Mac O’ The Hills stumbled on a few white boulders pushed by earth movements out of the fissure. The boulders were rich in gold and he blasted a great hole into the hard rock contents of the fissure. Natives murdered him threw the body down the hole filled it in, removed all outcropping rock and made gardens on the site. During the years since then, the country’s gone back wild, big trees have grown up – now find the old mine. Where are you going to look, for what signs will you seek? It’d take you years to quarter the odd forty thousand acres of wild timber and bush and you might camp on top of the old mine and not see a sign of it. Her chin resting in her cupped hands, elbows on the car’s side Morag stared at the hill, its slopes and the broken savage country about it. Ruarií whining softly crept against his mistress and the three men stole away. “She won’t chuck it,” said Mick. Anderson looked at Reg and raised his eyebrows, “Can’t you grasp the absolute futility of it Mr Lumsden? 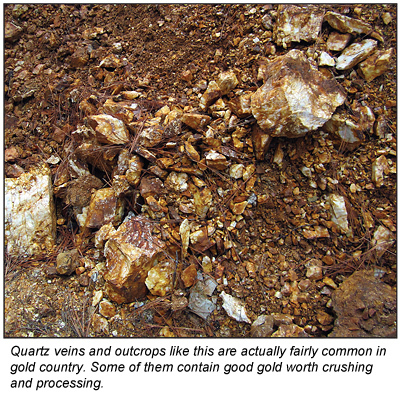 An experienced prospector studying the formation might gradually work to the likeliest spot for gold in the area. He’d stand chances of finding a dozen gold-bearing reefs all or any or none of which might prove good but it’s purely prospecting with everything that word in entails. Toiling through long yellow grass often five or six feet high they reached a tiny plateau halfway up Taba Mhlope. Seating them Anderson explained his theories. Anderson scratched his head and looked with a touch of seriousness at the girl. “There’s something in that” he admitted, “come to think of it he might have found it when looking for a leopard or lion. You’ll have to be careful about hunting. A place like that swarms with wild beasts. Wouldn’t be so risky after it was burnt out but you’re on a cattle ranch and God help anyone starting fires. “Didn’t you prospect up there, Mr Anderson?” Morag asked. Morag passed the next few hours in a dream. Try as she would the country around Taba Mhlope held no interest for her – hadn’t scores searched there and found nothing. Hadn’t even Mr Anderson admitted that probably no one had searched the cliffs. Yet wasn’t her Uncle’s very name prophetic Mac O’ The Hills, “Oh what a pity I promised to go to Mollie’s ranch.” Her thoughts were that the gold and the bones of Donald MacDonald are in the crags. Anderson seeing the girl’s absorption in the cliffs contented himself with striving to impress the salient points of prospecting on Reg. Mick listened with keen attention but his face wore a worried look. The miner did and on the way back Reginald’s expressive features blanched at some of the awful tales of snakes in general and the deadly black mamba in particular. The Robertsons insisted on the party remaining overnight a proposal acceptable to all after a long day of motoring and tramping. Mick whose horse had been brought on departed to fetch his cattle and after an interesting round of stables, byres and other ranch buildings the others sought baths and a change of garments, Ruarií finding friends apparently much to his liking amongst three silky haired red setters. After a well-served dinner, Anderson brought the subject of conversation around to Taba Mhlope and the many attempts to find MacDonald’s mine. 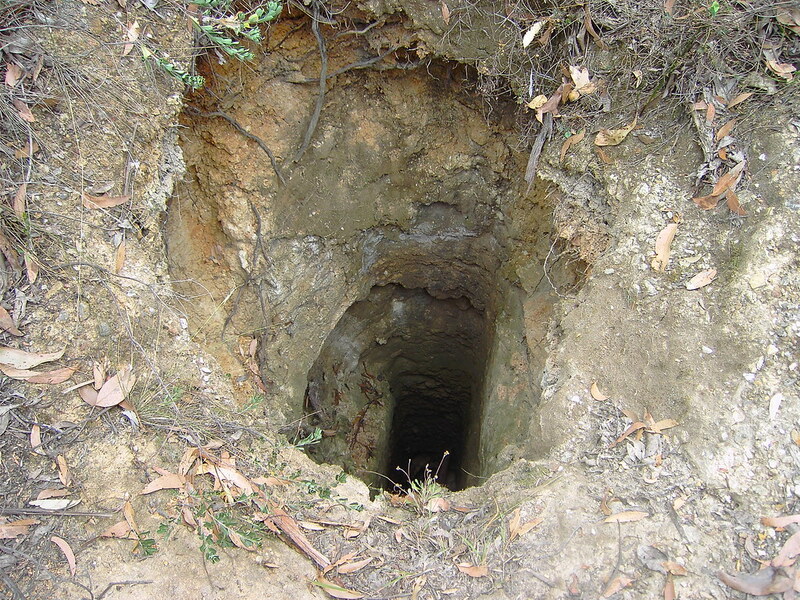 Robertson had been many years on the ranch and laughingly confessed that as a young cattleman he himself had wasted much of the Company’s time searching for the old shaft. “There must be plenty of old Matabele about who know where the mine is.” Interrupted Mick who bathed, shaved and attired in civilised garments had joined them. “Couldn’t you burn it out?” said Anderson. “Aye, it’s been burnt out several times but I couldn’t get Natives to go up even then. I’ve climbed it with white men but beyond the game, we saw nothing though it was an eerie atmosphere and I was glad to get down. In fact, we all felt the same and kept in a bunch. Just went straight to the top, had a smoke and came down – marvellous view. The conversation turned to cattle and the two older women began to discuss Mrs Robertson’s state of health which she believed would very likely necessitate a trip to England. “Oh but Mrs Robertson you didn’t think I’d ….” The older woman laughed. “Please don’t worry Mrs O’Connor. I’m glad you’ve come for I’d be quite happy at the thought of you here.” bending Mrs Robertson dropped her voice. End of last entry: But chaff was wasted on Morag at the mention of their goal being in sight. The car had topped a rise and from it, the party looked down into an immensity of space broken by countless low hills and wooded basins. Slightly westward of a long curving range stood a great solitary hill crowned with white cliffs. Anderson brought the car to a standstill. “Dashed good shooting down there I should think.” came Reginald’s voice. “Not a bad idea,” rejoined Mick, a note of deep sincerity in his voice and Morag felt the warm blood coursing tumultuously through her veins. Mick glared venomously at Reggie the while he waited anxiously for Morag’s answer. “It depends.” was the noncommittal reply but Mick’s heart leapt at the softness and shyness of her tone. Anderson grunted. The same thought had struck him. Headquarters staff would wonder quite a lot at a manager’s wife from a sister ranch flying out to look for gold mines on one of the company’s stations. Flushed with excitement Morag hunted for a fountain pen and writing pad whilst Mrs O’Connor attended her appearance and the men took Ruarií to stretch his legs. Ten minutes later the journey was resumed and in a short while after the party were being warmly welcomed by Mr Robertson, the tall grizzled ranch manager and his wife, a little-worn woman, whose appearance brought a pang of pity to the Hebridean girl’s heart. “Come away in! Come away in!” cried Mrs Robertson cheerily. “And I suppose half a dozen new diseases” finished the ranchman his eyes twinkling. Half an hour later amidst a chorus of laughing farewells the party minus Mrs O’Connor left, Morag’s ears still tingling with roars of laughter which is had greeted Anderson’s explanation of her quest. An hour’s run through what seemed a gigantic park where red bodied white-headed cattle grazed in hundreds brought them to the foot of a huge hill. Now and again glimpses had been caught as the car topped on one of the countless ridges which traversed the country but the realisation of the magnitude of her task came to Morag until Anderson stopping brought his arm round in a circular sweep. Absolutely bewildered Morag stood staring into a red cloud in which a frightened horse was rearing and plunging before a frantic Highland collie. From the rider came a stream of ejaculations, protests and shouts ending in, “Hold on Morag I’ll be back in the second” and down through the Hamlet tore the thick red cloud with Ruairí’s voice yapping with it. “But what on earth is Mick doing here?” cried Morag as she stepped out after the cattleman’s trail. Halfway to the hotel, she met the Rhodesian skipping along like a schoolboy with Ruairí racing round, springing and twisting in the air. With a wild whoop from Mick and a deafening din from Ruairí, man and dog swooped down on the girl. “Morag! What lucky wind blew you here? Mick cried seizing the girl and waltzing gaily round the dog. For a few moments, Morag romped lightheartedly vainly striving to sober not only her assailants but her own surging blood. But Mick was for no sobriety and hand in hand the two raced for the hotel, Ruairí, his muscular body stretched flinging up dust clouds ahead. Panting and laughing the boy and girl drew up before the scandalized Reggie, a greatly amused Mr Anderson and a wondering Mrs O’Connor. “What on earth are you doing here Mick?” asked the latter severely. “Just that all’s gone well. I left two lame heifers behind at the Emerald Ranch and lost one,” replied Mick sulkily. “Mollie you’re a pig,” said Anderson as he drove off Reggie and Morag waving to a disconsolate figure standing next to a horse. Morag flushed. Her whole being was running riot to the reaction of a cheery voice filled with joy at meeting her just when her spirits had dropped into the dust of Mapeta. Mick’s sinewy frame swinging easily to his horses’ plunges, the light of overwhelming joy in the grey Irish eyes, the boisterous schoolboy welcome he’d given her were all pictures filling Morag with longing for Mick and Mick alone. Anderson swung the car around and running back found Mick mournfully opening the bar with a key borrowed from the storekeeper to busy himself in serving natives to attend to the hotel business. “Where’re you resting your stock, Mick?” shouted Anderson applying the brakes. Even Reggie guffawed at the change in Mick’s expression. Unceremoniously Mick made room for himself between a shy, blushing girl and an excited collie and a much amused Reggie. “A dashed good country, Mick – Jove you look a sort of two gun man” said Reggie as he gazed admirably at Mick whose appearance was undoubtedly that of a desperado with his pinched in grey Stetson, wide khaki drill trousers, spurred boots and unbuttoned shirt its sleeves rolled above the elbows of a pair of lean sinewy arms whose colour was tanned to that of Maputa dust. But chaff was wasted on Morag at the mention of their goal being in sight. In two and a half years of captivity, I never saw an eatable meal issued by the German authorities. once a day a thin liquid called coffee was issued. This abomination was made from ground acorns barley meal and beet molasses and contained neither milk nor sugar. Twice a day great evil-smelling tubs of hogwash were drawn, the contents a soup of horseflesh, yellow maize meal, prunes and dried apples. For a change sugar-beet ensilage with chopped carrots and turnips, or most a beastly mess of putrid fish-roe soup with mashed potatoes. In Winter thirteen pounds, in Summer eighteen pounds of War bread was issued per man per month – a doughy mass of rye, potato and sawdust. Thrown against the wall it stuck there. Until our whereabouts was known to the British War Office we devoured huge quantities of these mixtures, all thin soup. When the tubs were carried to our quarters we rushed them, fought over them and sometimes fell into them to have one’s clothes instantly wrung out into basins and drunk. We bartered our clothes to the French for biscuits – braces 5, a kilt 50, a shirt 10 – all depending on condition and amount of vermin. Once we began to get our parcels the German rations were handed over to the Russians, Serbians, Romanians and Montenegrins who died off wholesale, some from the food and some from want of it. Eight funerals a day was the average in Sprottau but as we had never less than 40,000 Russians, 10,000 French and a few thousand other nationalities the Germans complained that prisoners-of-war were very tough and blamed the unsatisfactory death rate on the Order of St John of Jerusalem, the British Red Cross, Sir Edward Grey and Jannie Smuts. Immediately the War began, Funds were started to make captivity a little bearable – as the realisation came of the plight of the war prisoners in Germany immense efforts were made to relieve conditions. Relatives, friends, Clubs, newspapers, Regiments, ships all began sending parcels of foodstuffs to Germany. Popular figures received as many as forty food parcels in a mail, mostly bread gone mouldy in transit, eggs broke, homemade jam oozed from broken cardboard boxes, great cakes ruined by the eggs and jam. 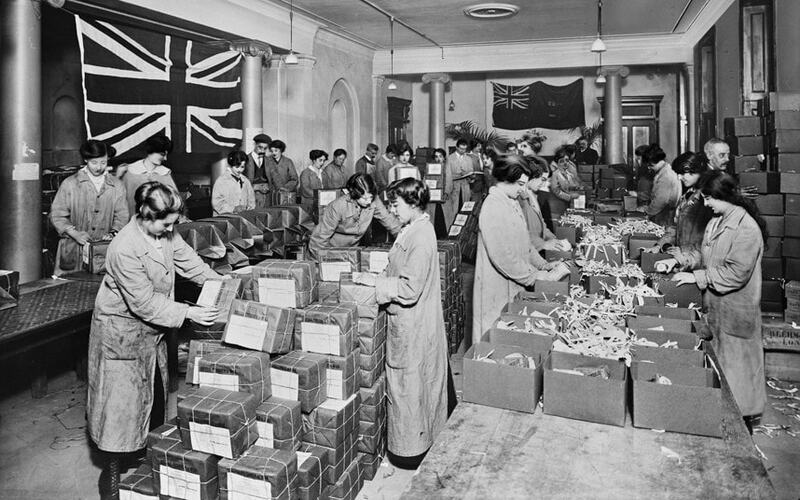 Packing food parcels for prisoners of war at the Australian Red Cross premises in Regent Street, London, January 1917. The organisation sent 395,695 food parcels and 36,339 clothing parcels to Allied PoWs in Germany and Turkey during the First World War. In December 1916, the Order of St John of Jerusalem in conjunction with the British Red Cross took over and from then on all parcels were packed in properly organised depots, guarantees were given to the German Government as to the nature of the contents and day after day sealed trucks crossed the German border bearing standard packets to Dülmen, Sprottau, Holtzminden and a hundred other prisoner-of-war camps. 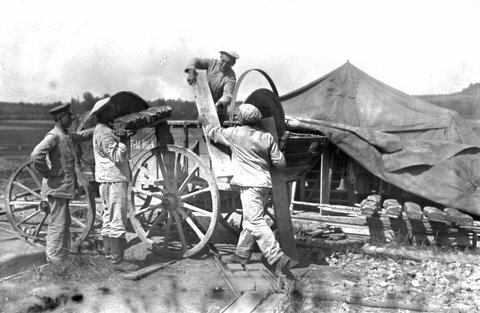 At the camps, the truck seals were broken by British or French NCOs under the supervision of a German Sergeant Major, the packets taken to an office and then issued to those in camp whilst the rest were sent by parcel post to those working on farms, in factories or mines. 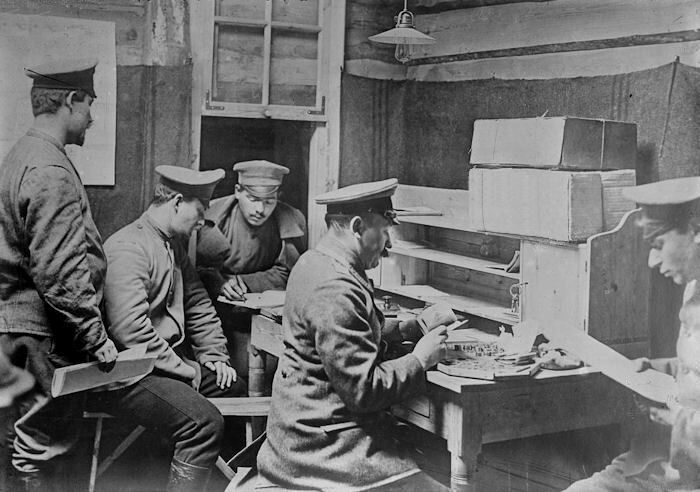 German censors reading through both incoming and outgoing mail at the Döberitz POW camp. After December 1916 every British prisoner-of-war received two hundred and eighty-one loaves of bread a month from whichever neutral country was nearest his camp. A. 1 tin bully beef, 1 cake of soap, 1 packet tea, 1 packet bacon, 1 tin jam, 1 bar Mexican chocolate and cigarettes. B. 1 tin McConachie’s rations, 1 packet Quaker Oats, 1 tin cocoa, 1 tin butter, I tin marmalade, 1 packet sugar, tobacco. D. 1 tin tripe and onions, 1 tin butter, 1 tin cooking fat, 1 shaving soap, 1 tin cigarettes and 1 tin pudding. 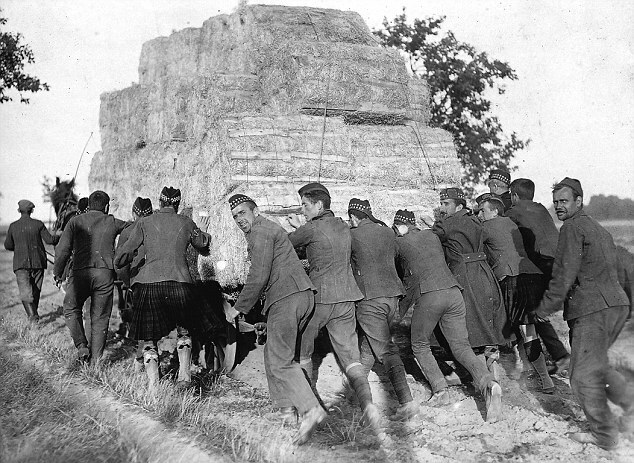 By forming small messes, buying stolen onions, potatoes and sugar from men coming in from farm and factory work and exchanging with the French who were wonderfully supplied with parcels; we always managed to live really well to the amazement of our German sentries and NCO’s who daily saw that another million tons of British shipping had been ‘versunkt‘. Because there was so little of it, food played a very important part in a POW’s life. 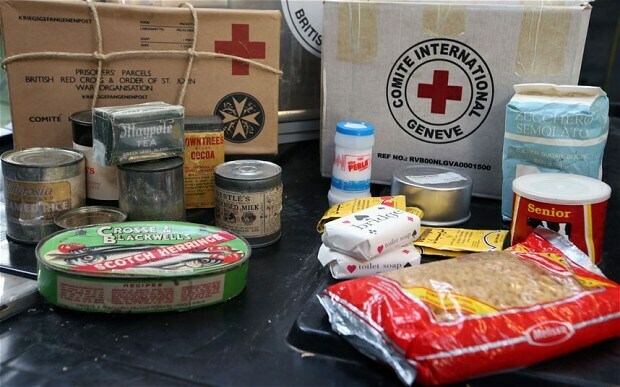 The International Committee of the Red Cross in Geneva provided food parcels to POWs from those countries which were signatories to the 1929 Geneva Convention. Here men at Stalag 383 at Hohenfels in Germany prepare their lunch using food from parcels. In two years I never lost a parcel and in addition to the food parcels we had monthly tobacco and cigarette parcels and every three months a complete clothing parcel – uniform, boots, gym shoes, two shirts, two singlets, cardigan, towels, neckerchief and once a year a great coat. This issue was received directly from the British War Office. All prisoners engaged in civilian employment were paid at current rates, farm hands a penny a day. On repatriation, we were paid out in full as regards army pay. 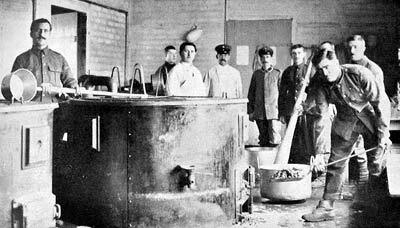 Working on farms, in factories, mines and other civilian employment prisoners-of-war received civilian rations; 2lbs sugar per month, bread as in the camps, a fairly liberal allowance of potatoes and as much sauerkraut as the stomach could hold. About 1lb of meat per man per week was boiled up in the sauerkraut and potatoes. Except for bread and sugar, all foodstuffs were issued as soup. No fats of any description were given except on farms where we shared the family meals, usually contributing to them from our parcels. End of 54th Entry: The War would be over long before he got there while in any case, it was a war of regular armies, not one for untrained men or Irregular forces. Returning to the estate Mick received a visit from his friend the Ranch Manager who took a different view. The war would last, Britain required every man and the sooner one joined up the better for his honour – he himself was half crippled so stood no earthly chance of being accepted, but as his initial share he would pay Mick’s fare to Cape Town. Mick’s duty lay beyond the seas – plenty of men unfit for service could take over the carrying on of the Country’s usual business. He would send over a horse for Mick that afternoon and he could catch the mail train South two days after. Mick filled with joy accepted immediately – the cattleman galloped off leaving Mick to write a letter to his employers explaining the circumstances, to arrange with the natives about carrying on until the new manager arrived to dispose of his kit. Mick went up deciding where he sold his rifle – returning he gathered his staff together held an auction sale of his belongings and with a blood horse between his knees dashed off towards the fourteen-mile distant ranch. Next day Mick spent in a last happy day amongst the big game. Waterbuck, Zebra and Sable were very plentiful but with a mind aflame on the coming days Mick’s shooting was vile, eventually after missing numerous easy shots he secured a fine Sable Antelope cow – his pleasure vanished when the baby calf came bawling round its dead mother, remaining next to the body to later follow the waggon back to camp. Attempts to catch it proved fruitless. Next day the Ranch Manager rode with Mick to the siding, unforeseen circumstances delayed their departure from the ranch so that when nearing the station they saw the fast approaching smoke of the train. A wild race ended in Mick flinging himself from the saddle to dash at an already moving train. Mick found the train crowded to suffocation point with Rhodesians, 90% of them on their way to the Colours – every class, every type was represented. There were men who had not seen civilization four years, family Black Sheep, younger sons – men who made good; men who had not. Some came from lonely prospecting camps, others from the cattle ranches. Many were home born, many Colonial Old Pioneers, ex-Royal North-West Mounted, men who had been sailors. Men who had held commissioned rank in the Regulars. Paying his fair to Bulawayo and being told by the guard to get a ticket to Cape Town at Bulawayo Mick was shoved into a Second Class compartment with already five occupants. One turned out to be a young Welshman mining down the Mazoe, another an ex-captain of the Royal Field Artillery and Indian Army, now a mining man, the other three being nondescripts. The bulk of the men travelling on the train had converted all easy negotiable securities into ready cash and filled with excitement, unaccustomed companionship and the herd-feeling spent their money like water. The result was that soon a large percentage were in anything but a sober condition – few were drunk, but at the same time hardly any preserved any semblance of caution in dealing with chance companions. Mick and the Welshman returning from the dining salon saloon found the ex-artillery Captain half dazed trying to explain to a sceptical conductor and a crowd of amused onlookers that he’d been drawn into a card game, drugged and robbed by the other three inmates of the compartment. As it happened a couple of passengers, men of standing, recognised two of the accused as being well-known Crooks and the Artilleryman proved that he was a man of substance well known in mining circles. The crooks all three of them were promptly subjected to severe hustling and the train stopping at a Bechuanaland siding were put overboard into the dark and lonely night. 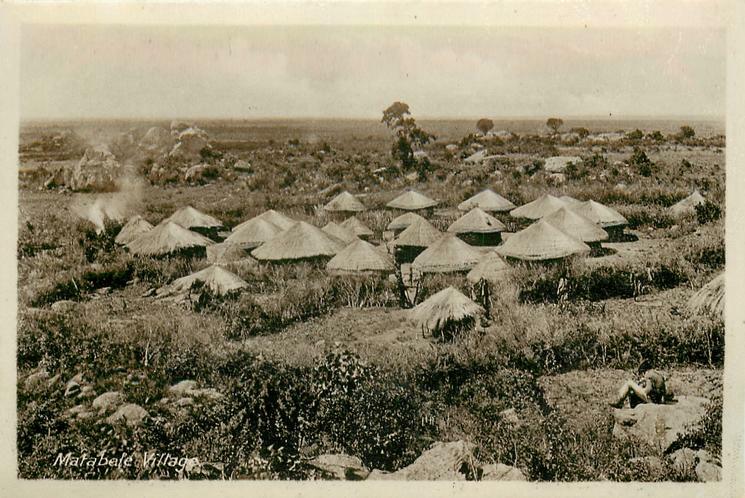 As far as Kimberly the journey was uneventful but when the Rhodesian mail steamed in, it was to find station packed with troop trains – The Natal Field Artillery, Kaffarian Rifles and a dozen other units. From then on the mail crept slowly along continually being sidetracked to allow troop trains to pass. Every minute was a delight to the Rhodesians – batteries of artillery, trainloads of soldiers, truckloads of horses – bugles and trumpets sounding, with everywhere the sharp bark of army commands. It brought the first taste of war to the eager nostrils of the men from the Rhodesian bush going to war in defence of life, liberty, hearth and home. The wolfhounds of a warrior nation hungering, thirsting for the wild clamour of battle, the pomp and panolpy of war – Children of the Red Gods hastening to harvest. Throughout the wide wide world, others of their kin were rushing homewards from the ice floes of Labrador, the Savage Klondyke, the scorching Australian deserts, the fever jungle of New Guinea. “You don’t think Dad you’ll have any difficulty in getting into a regiment?” asked the other. Food gave out on the train, drink came to an end, Mick and many others finished their last penny – the train was already a couple of days late but at station bars and stores, from the boyish troops of the Union Defence Force – lads eighteen to twenty-one came help and hospitality. Then came a whisper through the long train – the German spies or Dutch rebels had blown up two troop trains on the Hex River Pass. Hundreds of lads were killed, the trains halted and the rumours increased – there was a possibility of attack at any moment – most of the inhabitants of the surrounding country were red hot rebels and what a glorious chance to wipe out old Boer War grudges, thousands of sons of English and loyal Dutch without ammunition penned like sheep in the many troop trains. The more authentic news came – an accident had happened, one troop train had left the rails resulting in a heavy casualty list, but luckily in a portion of the Pass where a brow had stopped the train from landing in the Hex River a thousand feet below. The trains steamed on into Touws River where already poor mangled bodies were being carried from railway carriages. 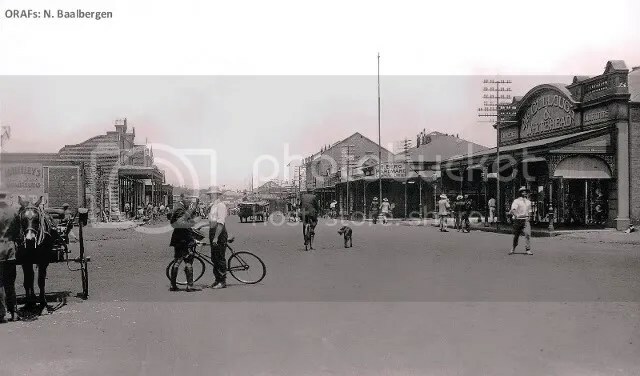 The few white women of the neighbourhood – young girls, matrons, old women, all kindly Dutch, laboured like trained nurses, freely putting their cottages and houses at the disposal of the Commanding Officers. “By God, the lads are proper cubs of the Old Lion,” said a Rhodesian whose life had been passed leading men in Frontier Wars. 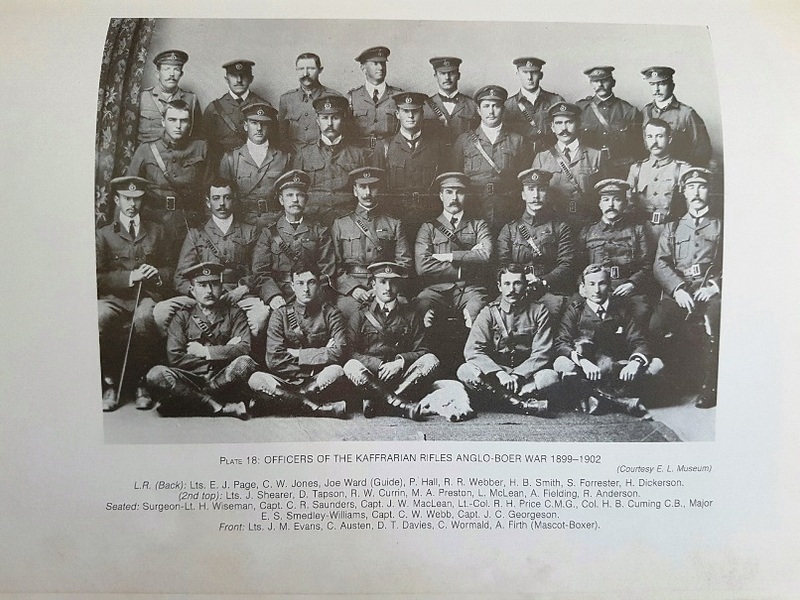 “Only schoolboys and they’ve the discipline of veterans – none rushing to look at the casualties, everyone cool, calm and collected, the poultice wallahs working like R.A.M.C. men – they’ve passed their preliminary test with honours – rotten thing thousands of children straight from their homes, all singing and happy to suddenly be flung into a mass of Death and mangled bodies – good training though as for casualties – killed and wounded on active service – counts just the same as actual battle casualties. Late the next afternoon the line cleared the trains moved on, through the tunnel and out of the vast lonely Karoo into a glorious world of mountain peaks, smiling valley and brawling hill burns. Twisting and turning like serpents the long procession of heavily laden trains crawled round the cutting powerful engines before and behind holding their burdens of precious freight. An ox wagon deposited Mick, four natives, their worldly goods and an assortment of agricultural implements on the banks of a broad river flowing between high banks. Having brought the new manager and his assistants the waggon departed leaving its former passengers to their work of taming the wilderness. Mick’s first work was to put one man onto collecting wood, making a fire and getting a kettle of water on. Meanwhile, the other three were sent to chop saplings, strip away pliable tough inner bark for tying purposes, cut grass for thatching and to generally busy themselves in preparing for the erection of the Estate Manager’s residence. Having got the staff at work the Manager armed with his Martini set off along the river to survey his domain. Some months previously two spans of oxen each with a four furrow disc plough had been sent down to break up as much as they could of the rich alluvial riverbank. The estate had nine miles of river frontage which gave them almost that length of twenty-foot deep chocolate soil varying in width from three or four yards to a couple of hundred. This was the actual bank – beyond lay swamps of heavy black soil of inexhaustible fertility which years after bore enormous crops of wheat. From the swamps, the ground rose in a gentle slope to a heavily timbered ridge beyond which lay the broad watershed of forest country. Walking down the river bank Mick was gratified to find large acreages of rich soil broken up and amazed at the plentiful signs of big game. Soon he paused in wonder at some enormous footprints a thrill running through him as he remembered that the river was full of hippopotami. A little further on he came to a sight which made him realise that a farm alive with game was not an unmixed blessing. Quite a fair acreage had been rushed into maize which had grown splendidly. Its growth had surprised and pleased Godfrey but his pleasure and appreciation was nothing to that of a family of hippo. Cursing at the destruction before him Mick walked through a large field of what had seemingly been a ten bag to the acre crop. Hippo paths ran everywhere – waterbuck, Kudu, sable, wild pig and small buck appeared to have been as attracted as the hippo and Mick groaned as he wondered how on earth he was going to grow crops for markets instead of feed for a teeming game reserve. The next few weeks gave him little leisure – cattle and more boys arrived, his hut was built. What the game that left of the maize crop was reaped, shelled and dragged on the rough sledge to a siding nine miles away. Cattle kraals – rough log and bush enclosures were made – a strip of land broken up for tobacco seed beads, lands selected for tobacco and all the time hard ploughing of the rich maize lands went on with four four furrow disc ploughs. Realising that his hut had been built in a death trap – a great swamp on two sides, the river a few yards in front – Mick pushed on the construction of a Robinson Crusoe building at the edge of the forest. 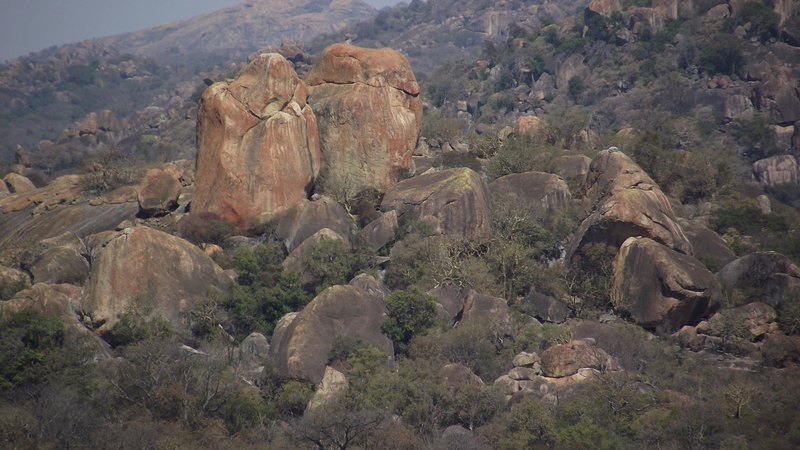 From here he commanded to truly wonderful view hills, river scenery, bush country and the Umvukwe Mountains. Though with little leisure on his hands quite a lot of game fell to the old Martini. Apparently, no hunting had taken place for years resulting in the game being quite unafraid of man. Elephants passed through on their way from Hartley to Lomagundi reports came of lions – once a herd of magnificent sable antelope black bodied, white-bellied under a forest of curved horns trotted curiously up to the very building he was erecting – hardly a day passed without a seeing game and the camp was seldom without meat sometimes shot from the door or window of Mick’s hut. The river yielded quite good fish and gave some exciting sport shooting at crocodiles or watching a family of monstrous hippo at play. So Mick shot sable, kudu, waterbuck, tsessebe and reedbuck, went to look at elephant, watched hippo, found alluvial gold in small quantities and spent Sundays panning the river bars or fishing. He was never lonely, but always full of content. Now and again a pile of newspapers reached him all full of the Wars between Montenegro, Greece, Serbia, and Turkey. 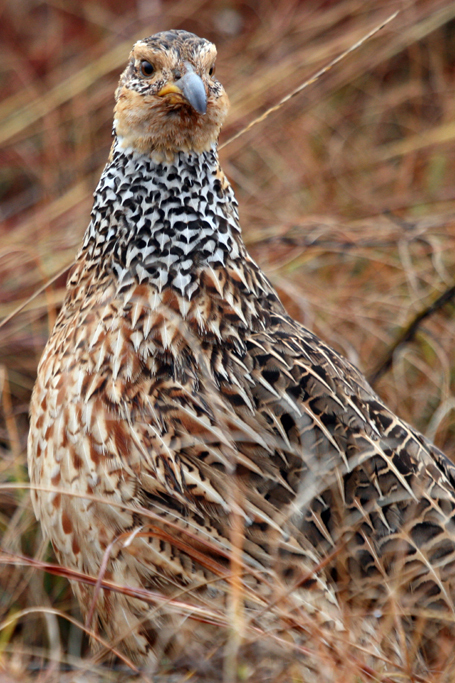 One of Mick’s most thrilling encounters with game however was, when accompanied by two half-grown dogs, a cross between red setter and water spaniel, he put up a full-grown reedbuck ram and let it have a charge of birdshot. The buck stumbled and like a flash the two dogs were on him – he threw them off but Mick with a wild yell flung himself on top of the now seriously annoyed buck who with a vicious swing of his horns caught Mick a glancing blow sending him bruised and winded in the river – the dogs half frantic with joy had taken full advantage of Mick’s assault and rushing in secured holds. The reedbuck now on his feet attempted to plunge forward but the dogs held – with a quick twist the maddened animal knocked one dog away with his horns tearing a long gash in the pups flank – as the reedbuck struck at the other Mick panting and wet once again dived at him only to get a hind hoof fair and square in the chest – down dropped Mick but the wounded dog again fastened on – the other dog let go – the reedbuck dashed forward and the free dog having got his breath again sprang for a hold whilst Mick undauntedly hurled himself for the third time on his quarry. A desperate wrestling match ended in an exhausted antelope, two dogs and a man lying sobbing for breath the buck watching his enemies they keeping wary eyes on him – once again he made a plunge forward – down he went with three frenzied tacklers on top – again all rested and Mick stealthily drew a hunting knife – at his movement the buck again attempted a dash but this time the long cruel knife bit deeply into his throat – madly he struggled but with the ferocity of a savage Mick sawed and with a gurgling moan the noble beast began to weaken as the streams of blood spurted from severed vein and artery. Another powerful slash of the keen knife and with glazing eyes the buck rolled over conquered. Hunting either alone, accompanied by a native or with Tom was Mick’s ruling passion though once having tasted the joys of dropping a bird on the wing he became less enamoured of the rifle. Redwing partridge, wild duck and geese were his favourite shooting and during the maize harvest, he was seldom without a gun. For a thoroughly enjoyable morning, however, Mick yielded the palm to a big drive – the long line fo guns and beaters advancing through the maize and dense reeds – the barking of a hundred dogs mingling with the shouts of their owners. The cries of Mark Right – Mark Left accompanied by a blaze of rifle and shotgun fires as buck or bird dashed along or whirred over the line kept him in roars of laughter and thrills of tension. Many of the guns would blaze away out of sheer excitement or devilment whether there was a chance of a hit or not. Mick was receiving a small salary and a percentage of profits. The tobacco and maize yielding well Mick found that for the first time since leaving Grahamstown he was possessed of quite a handsome sum. On engaging him Godfrey had arranged credit terms in Salisbury so that Mick had been enabled to stock his wardrobe and later buy a bicycle – besides keeping himself supplied with ammunition, tobacco and little luxuries. After the second crop, eighteen months had passed on the estate and two and a half years since he bade his last farewell to the sea. The crops had not only been heavy but had realised high figures the tobacco realising an average of well over two shillings a pound. Godfrey well satisfied with his year’s results gave Mick a holiday and advised him to go off home for a month or two. Filled with delight Mick went into Salisbury, cashed a handsome cheque booked his passage to South Africa and went up to the old Commercial Hotel for a drink.